Its all about the Heart ! As the title would say today is all about the heart or hearts in this case. 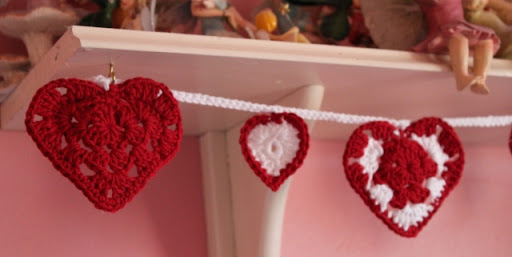 This week I worked through the different size hearts I wanted for the garland and finished them off. 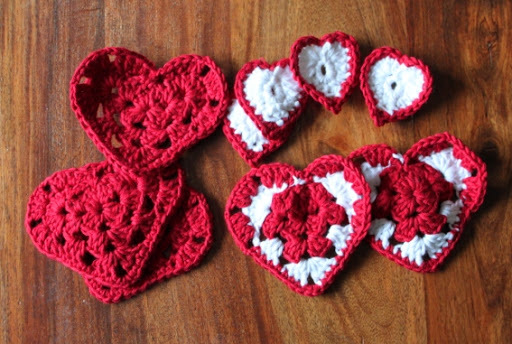 The smaller heart is from Attic24’s blog tutorial, I just added a border of red to it. I chained a length to fit where I was hanging it and then slip stitched back through each length to make the cord thicker and attached the hearts as I went. I used King Cole’s Bamboo Cotton for this with a 4mm hook, the yarn is lovely and soft but at times was a bit splitty, now that could be down to my inexperience to but the hearts were going to be to floppy to hang the way I wanted them to. While reading Attic24’s blog with the smaller hearts I’d read she used PVA glue to stiffen up the backs of some items she wanted to hang so I gave it a go and Caoimhe and I happily spent an evening painting PVA glue onto the backs of the hearts. It worked perfectly, hardening up the backs but keeping the front nice and soft. It dried clear and the hearts hung the way I wanted them to. Nothing else remained only to let it dry and hang it up in its place. Its now hanging in its place under the girls fairy shelf, I’ve been collecting fairy statues for the girls from when Caoimhe was born and that’s what you see on top! I have to say for a project that was a mere picture in my head and taking into account my inexperience in crochet I’m awfully proud of this garland ! and if I may say so I do a mini happy dance on seeing it each time I walk into the room. This entry was posted in Uncategorized and tagged Heart Garland.. Bookmark the permalink. 15 Responses to Its all about the Heart ! Oooh, the garland turned fab! What a cute idea, the banner. It's been awhile since I've finished anything…need some smaller projects so I can feel like I'm getting something done. Sweet, Ruth. Your hearts are great and the fairy shelf is a fun idea. You must be so pleased it looks fantastic. I should say so! You should be doing a happy dance! I can't believe how fast you picked up that crochet! You did a beautiful job on the hearts and I didn't know about the glue on the back so thanks for telling me! Look at all those fairies! How cute are they? Fairies are REALLY big here in the U.S. with little girls right now. Looks like you were ahead of the curve!